You can even incorporate your baby into your yoga practice. After surrendering your body to your baby for nine months, you're probably anxious to ditch the baby weight and get your old body back. Postnatal yoga can be one component to a post-pregnancy workout to lose weight, but it's not the only part. Still, a heavy emphasis on abdominal strength paired with a little "me" time can definitely help the recovery process after being pregnant, especially when you combine yoga with other weight-loss efforts. In general, your OB will probably give you the go-ahead for normal activities in the four to six weeks after delivery. 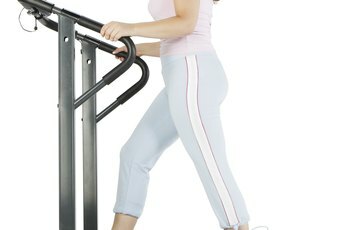 Still, unless you were active for your entire pregnancy, getting back into the swing of regular exercise can be hard. Enter yoga. It's gentle, challenging and offers a chance for you to build muscle tone and firm your core. As an added bonus, a 2010 issue of the "Journal of Evidence-Based Complementary & Alternative Medicine" found that yoga helped relieve depression symptoms in a majority of cases, meaning taking a yoga class yourself could help stave off the baby blues. As a new mom, you have a few different options for working yoga into your daily schedule. You can give it a shot at home by downloading yoga videos or borrowing them from your library. 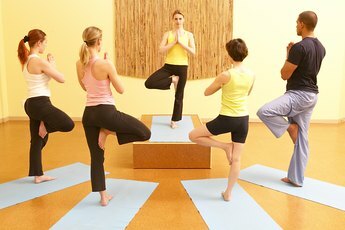 When you're ready to challenge yourself a little more, a community hatha yoga class is an excellent choice. If you can't find a sitter, see if you can find a class built around babies. Some yoga classes use babies as resistance weight for moms. The time spent together allows you to relax and bond with your newborn while sneaking in some time for yourself. While yoga is generally appropriate for all fitness levels, you'll still need to find a class that suits your needs, which may be difficult with your new sleepless schedule. If you do practice yoga at home, make sure to use a video or slideshow that shows you the correct posture or you could risk injury. Unfortunately, yoga won't be enough to help you drop all of the pregnancy weight alone. While it can help tone your muscles and help you relax, you'll need a more balanced workout routine -- complete with 30 minutes of cardio each day -- paired with a healthy diet to really see results. If you're serious about dropping those last few baby pounds, make yoga part of your regular routine in the morning or at night. Then, add in daily cardio and healthy meals. If you're nursing, you'll need to consume about 300 calories extra per day to support your breastfeeding, so focus on foods that are high in nutritional value but low in saturated fats and calories to help those pounds finally come off. If you're still struggling with baby weight after several months, it's a good idea to see a nutritionist along with your workout efforts to see where you might be sabotaging your own efforts. Journal of Evidence-Based Complementary & Alternative Medicine: Yoga as a Complementary Therapy for Clinical Depression; Purvi Mehta et al. Fit Sugar: Waiting Period for Exercise After Having a Baby?